Explains how a Turnitin assignment submission is made. Please ensure you read the file type / size requirements before submitting a Turnitin assignment. If you don’t comply with these requirements, you won’t be able to submit, please use google chrome via a pc/mac for submitting your assignment. Note, we advise that you don't put any personal details within your submission, except for your username. Watch our video guide or follow the instructions below. In your module, click the Turnitin submission link. Your tutor can tell you where it is. - Please read the assignment instructions provided by your tutor. - The current Status, Start Date and Due Date for the assignment are displayed. - The Post Date is when your marks and feedback will be available if your tutor marks your assignment online. - Click Submissions Inbox to see any previous submissions you've made (if your tutor has set up the assignment so that you can overwrite your submissions until the due date - see our guide to resubmission for more information). Click Submit to start a new submission. If you have the option, choose the submission method File Upload. Click Choose File to locate the document you wish to upload. You must tick the box to accept the declaration Notice before submitting. If the Turnitin User Agreement message does not disappear, see our guide for more information. When the submission is complete, you'll see a green bar near the top of the screen telling you that your submission was successful and a digital receipt will appear on screen. If you experience any problems, please check our guide to Turnitin error messages for help. Click the Submissions Inbox to see your submission. Click the assignment name to open it. 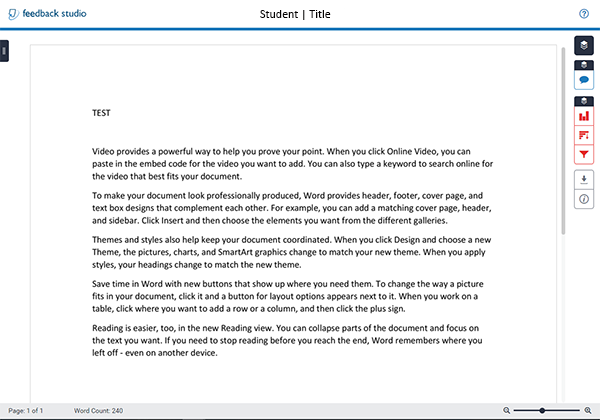 The Turnitin document viewer, Feedback Studio, opens. You can view the similarity report by clicking the match overview icon on the right, but bear in mind that this can take up to 48 hours to generate. Our guide to viewing and interpreting your similarity report explains this in more detail. If your tutor is marking and providing feedback online, you'll be able to view it by clicking the feedback icon (a speech bubble) on the right. This won't be available immediately after submission - you'll need to wait until the post date. Our guide to viewing your marks and feedback provides more information about this.